At the recent Summit Awesome Hackathon in Manchester, my team were working on a web app that updated a user’s bio on various social networks in one place. This meant getting down and dirty with various social network APIs (not a pretty thing I can tell you). 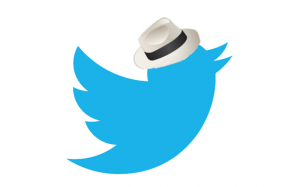 I thought I’d do a quick write up on how you can authenticate users in a Sinatra app by allowing them to sign in with Twitter. "This is the public page - everybody is welcome!" "This is the private page - members only"
This sets up a helper method called admin? that we can use to check if a user is logged in. It’s set to true by default to enable us to check that things work. We’ve also set up two route handlers. The first is for the route ‘/public’, which shows a message to everybody who visits. The second route is a private page that will only show the message if the admin? helper returns true. If not, then we use Sinatra’s halt method to stop the app in it’s tracks and show a ‘Not Authorized’ message. To check that this happens, change the admin? helper method to false, restart the server (ruby main.rb) and go to ‘http://localhost:4567/private’. "You are now logged in"
"You are now logged out"
Now restart the server and try going to ‘http://localhost:4567/login’, then go to ‘http://localhost:4567/private’, and you should be able to see the page. Go to ‘http://localhost:4567/logout’, then try ‘http://localhost:4567/private’ again, and you should get the ‘unauthorized’ message. Great – we have a working log in and log out system. The next step is to use Twitter to authenticate the user instead of just allowing anybody to log in using the login url. Before you can start using Twitter to sign in, you need to register your app with Twitter. This is easily done – just head over to https://dev.twitter.com/apps and log in using your Twitter credentials. Then click on the ‘create a new application’ button and fill in the form. You can pick any name for your application (as long as it doesn’t contain the word ‘Twitter’) and can use any website as a placeholder until you get an actual domain name for your application. For example, I used http://www.sitepoint.com. In the callback URL field, you need to add /auth/twitter/callback to whichever URL you used in the website field. For example, I used http://www.sitepoint.com/auth/twitter/callback. You will then be taken to a page that contains the OAuth settings for your application. Make a note of the ‘consumer key’ and ‘consumer secret’ as we will be using them in our app. Note that if you were using GitHub, the URL would be “/auth/github”. This will take the user into Twitter and ask them if it’s okay to allow your app to access Twitter. This displays the message that is sent back from Twitter as to why the authentication failed. Now we have a fully functional login system that uses Twitter for authentication. This is one of the things I love about Sinatra – we’ve whipped up a fully functional login system that uses Twitter for authentication in around 40 lines of code! Now that we have somebody logged in with Twitter, what can we do? Now try loggin in using Twitter and you will see all the information from your Twitter account that is held in the hash. Once you’ve got a user authenticated with Twitter, you can theoretcially go on and start manipulating their Twitter account. What you are allowed to do depends on what you access the user grants to the application (you can select whether you want read only or read and write access for your application in the settings tab on the Twitter Developer site). Omniauth doesn’t actually let you manipulate a twitter account though. To do this you will need to install the twitter gem. There’s not enough room to go into using that now, maybe in a future post … but you might want to have a play around with it yourself in the meantime.